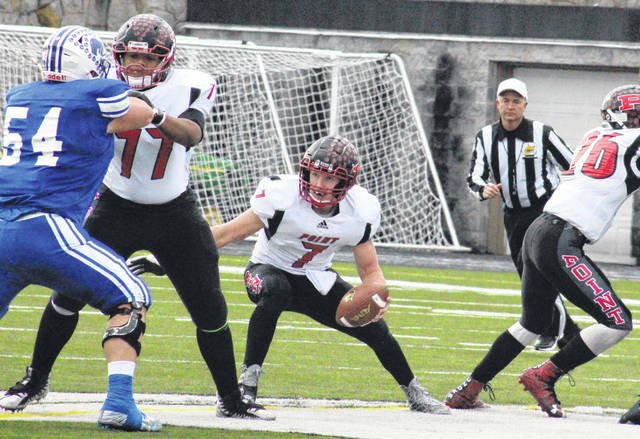 Point Pleasant quarterback Cason Payne (7) scrambles behind a block from Trevon Franklin (77), during the Big Blacks’ season finale on Saturday in Fairmont, W.Va.
Point Pleasant senior Josh Wamsley (2) makes it a two-point game with 28-yard touchdown run, during the Saturday’s Class AA quarterfinal at East-West Stadium in Fairmont, W.Va.
FAIRMONT, W.Va. — If you can’t win them all, it’s better to be beaten by the best. The eighth-seed Point Pleasant football team had its 2018 campaign come to an end at the hands of top-ranked Fairmont Senior, in the Class AA quarterfinal on Saturday at East-West Stadium in Marion County. Point Pleasant (9-2) — which suffered its other setback of the season to the then No. 1 team in Class AAA, Spring Valley — surrendered 58 consecutive points to the Polar Bears (12-0) in the middle of Saturday’s tilt, as Fairmont Senior punched its ticket to the state semifinal with a 66-13 victory. The Polar Bears — who found the end zone on their first eight offensive drives — needed 3:23 to score on the opening possession of the game, with Breeden Gilbert blasting into the end zone on a nine-yard run and Gage Michael following up with a two-point conversion run. The Big Blacks answered on their first offensive possession, with senior Josh Wamsley breaking a 29-yard touchdown run to cut the deficit to 8-6 with 4:57 left in the first. After blocking the PPHS extra point try, FSHS needed 2:30 to make its lead 16-6, as Gilbert found paydirt on an 11-yard run and Gage Mitchell ran in the two-point try. Point Pleasant took the game into the second quarter, but lost possession on downs on its next drive. The hosts increased their lead to 23-6 with 8:22 left in the half, as Conner Neal scored on a six-yard run and Frankie Smith made his first of six point-after kicks. The Big Blacks went three-and-out on their next two drives, and Fairmont Senior increased its lead to 38-6 by halftime, as Rhett Heston scored on a two-yard run, and Neal punched in from one-yard out. PPHS fumbled its first drive of the second half, with Fairmont Senior’s Nathaniel Clifton recovering the ball and returning it 35 yards for a touchdown. 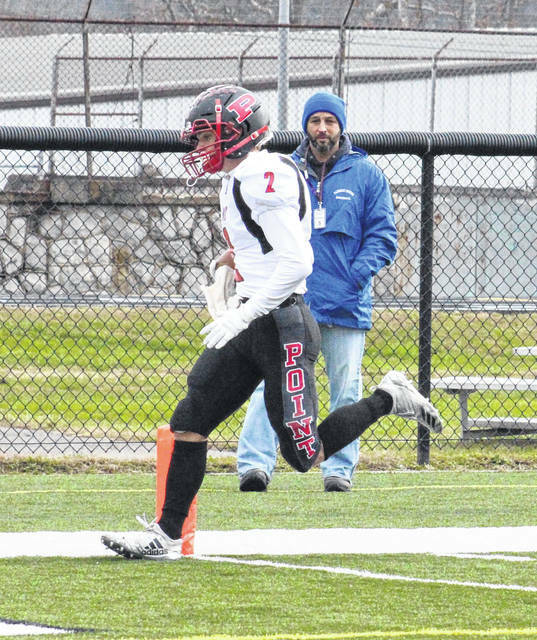 Point Pleasant’s next possession was cut short when Exavier Posey intercepted a pass. Fairmont Senior increased its lead to 52-6, as Gilbert caught a 15-yard scoring pass from Neal with 9:53 left in the third. The Big Blacks were stopped short on a fourth down try on their next possession, and the Polar Bear lead grew to 59-6 with 35 seconds left in the third, when Heston scored on a three-yard run. Next, Point Pleasant lost a fumble at its own six-yard line, and Heston found paydirt on the very next play to give FSHS a 60-point advantage with 10:58 to play. The Big Blacks scored one for the road on their ensuring drive, as Wamsley found the end zone on a four-yard run and Oliver Skeie connected the point-after kick, making the final score 66-13 in favor of the hosts. Following the contest, 12th-year PPHS head coach David Darst acknowledged that the Polar Bears are a team that you don’t want to catch when you’re not playing your best. “There’s no doubt, that was a really good football team, but we didn’t help them either,” Darst said. “We had a lot of turnovers today. Offensively we sputtered, we made a lot of mistakes. You do that against teams that aren’t very good and you can overcome it, but you do that against a good football team and it puts points on the board. Fairmont Senior earned a 22-to-13 edge in first downs and a 473-to-178 advantage in total offense. 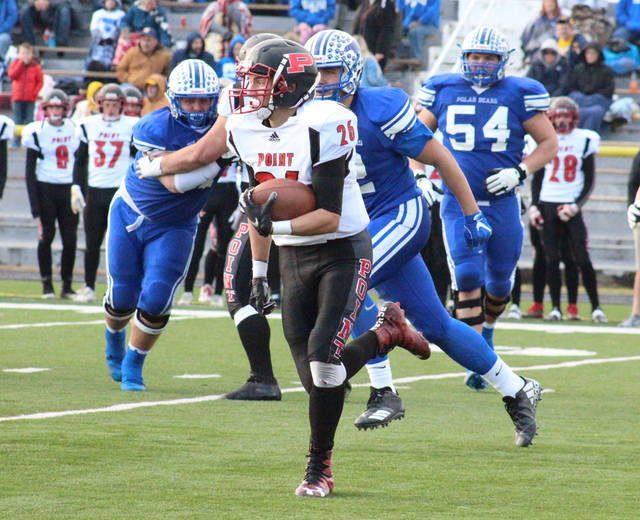 Point Pleasant was penalized six times for 38 yards, while FSHS was sent back 13 times for 118. PPHS senior Cason Payne completed 6-of-15 passes for 28 yards, while carrying the ball 21 times for a net gain of 33. Wamsley hauled in a team-best three passes for 14 yards and gained a team-high 66 yards with two touchdowns on five rushing attempts. Brady Adkins had nine carries for 39 yards and one reception for three, Christian Holland toted the rock three times for 21 yards, while James Musgrave and Aiden Sang caught a pass apiece, gaining seven and four yards respectively. For the hosts, Neal was 17-of-20 passing for 302 yards and a touchdown, while rushing nine times for 49 yards and two more scores. Gilbert had 100 total yards and three touchdowns, combining seven carries and a pair of receptions. J.D. Smith and Camden Longwell caught four passes apiece, gaining 55 and 29 yards respectively. This marks the final game in the prep careers of PPHS seniors Josh Wamsley, Christian Holland, Cason Payne, James Musgrave, Ian Smith, Andrew Jones, Winter Nibert, Colton Carr, Eddie Mayes, Tyron Howell, Blayne Butler, Ryan Kinniard, Trevon Franklin and Devin Burris. PPHS has advanced to at least the second round of the postseason every year with the 14 seniors. 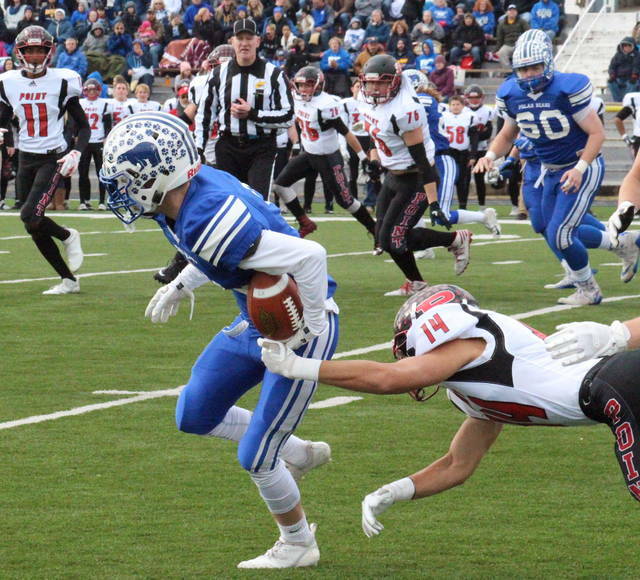 Fairmont Senior moves on to the Class AA semifinal, in which it hosts No. 12 Weir, which has knocked off back-to-back top-5 teams. FSHS defeated WHS 43-13 in the regular season.